The event, which will feature an on-site industrial paper shredder, will take place this Saturday, April 7, from 9-11 a.m. at my district office located at 515 Stump Road in Montgomery Township. There is no limit on the number of electronics individuals can recycle or the amount of paper that can be shredded, but no Freon containing devices or microwaves will be accepted for the electronic recycling event. The Community Shredding and Electronic Event will be open to individuals only. 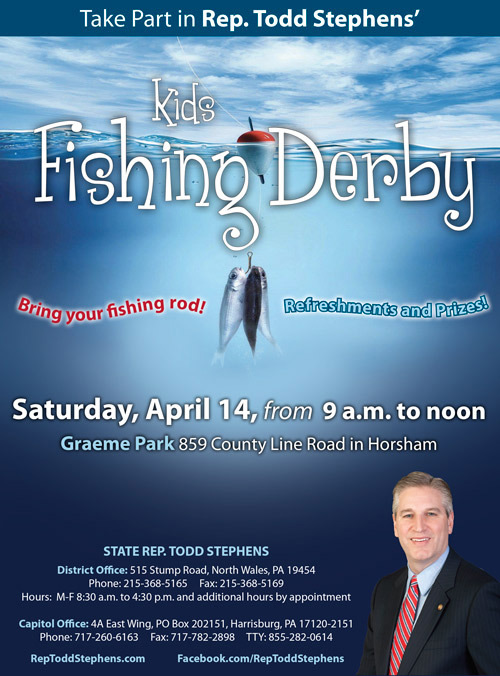 To help young people gain a better appreciation of fishing, I will host another Kids Fishing Derby at Graeme Park, 859 County Line Road in Horsham, on April 14, 9 a.m. to noon. This is a great opportunity to introduce a young one to the pleasures of fishing. We’ll make it fun by holding a number of contests and awarding prizes. I encourage you to grab your gear and come out. Call my office at 215-368-5165 for more information. In Pennsylvania, 16,050 distracted driving crashes resulted in 69 fatalities during 2016, with the state courts reporting a 52 percent increase in citations for distracted driving last year. That’s why the House Transportation Committee, on which I serve, is continuing to look into the issue with a public hearing this week on two current proposals. How do we stop speeding on local roads? The issue of allowing municipal police to use radar to detect vehicle speeds on local roadways was discussed during a hearing of the House Transportation Committee this week. Pennsylvania is the only state in the nation that does not permit our police to use radar. Under current Pennsylvania law, only the state police can use radar to track vehicle speed. Nominations for markers can be submitted by an individual or organization and are evaluated by a panel of independent experts from throughout the state and approved by the agency’s commissioners. For more information, including application information, visit PAHistoricalMarkers.com.